When the local news said that four homeowners who moved sand around on the beach to create a sand barrier in front of their homes included the CEO of United Airlines, I did a little research. Oscar Munoz owns what I assume is a vacation home (his office is in Chicago) worth over $6,000,000 in Ponte Vedra. He also paid $3.5 million for part of Oprah's old condo in Chicago. That's around $10,000,000 in housing, so being a CEO seems like a pretty good gig. And you probably get used to getting your way. What do World Water Day and St. Johns River Cleanup Day have in common? Both of them were mentioned in my JEA bill flyer that I received on 3/29/2018 and that was billed on 3/23/2018. Actually, an Arbor Day free tree giveaway for Jax was also mentioned, so that's cool. The problem is, since these events had already taken place by the time I got the flyer, I participated in none of the events. I saw and ad for a local news channel's Woman of the Week (which got me to wondering if there's a Man of the Week), and the woman who was chosen was affiliated with the Ms. Senior Jacksonville Pageant. I do not know anything about this particular pageant, but it did get me to wondering just a bit. The City of Jacksonville purchased this 144-acre site in 1994, and was formerly the Dunes Golf course [...] Formerly known as District II Regional Park, it was renamed in May 2005 in honor of former Jacksonville Mayor Ed Austin. My Alarm System Hard Wired Smoke Alarms Keep Chirping - Now What? This is a specific problem you might run into if you purchased a home with an alarm system and hard-wired smoke alarms, and if you went and disconnected the alarm system. Or if you're thinking of disabling the alarm because it's just annoying, but you're worried about what might happen to your smoke detectors. Everyone wants to live in St. Johns County. Just like where I'm from, those people all say it's because of the schools. But that was supposed to be the purpose of consolidating Jacksonville's schools. Jacksonville went with an experiment that I actually would have thought might work, especially given the sheer distances created by making Jacksonville so huge. But it failed. Why? I'm not sure, but I'm still trying to figure out why so many people see St. Johns as the place to be. What in the world is going on with Jax city government that we need code words for potential business development? As a naturally cynical person, I'm going to assume it's because if the names of the companies were disclosed, someone out there might argue against it because of the track record of the company. Or maybe all local governments work in secrecy. I was at an HOA meeting tonight, and it surprised me when I asked about the widening of Kernan that the HOA did not seem to agree with one of the design elements I'd seen. 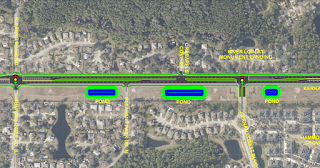 The board members told me that there were no plans for traffic lights at Kernan Forest Boulevard and Kernan Boulevard, based on their own experiences with meetings and plans. 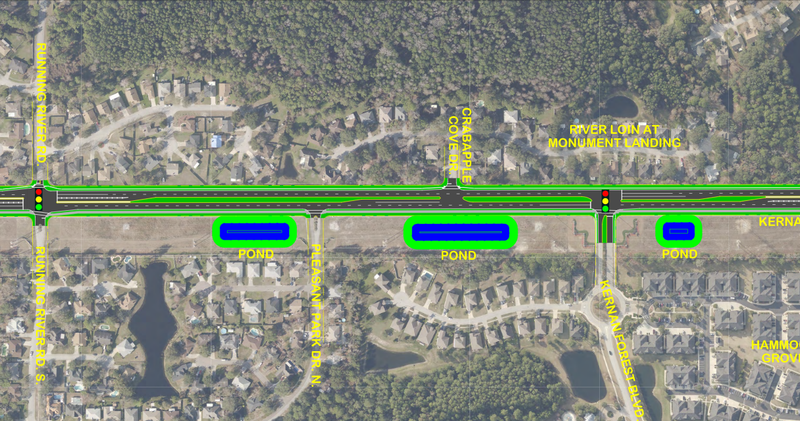 However, the plans that are readily available online (and the only way I knew any information about the project), clearly show traffic signals at Kernan Forest, Running River, and Mastin Cove. I was watching Paternity Court, which is bad enough, but then the woman who was trying to prove the man in court was the man who made her a mommy said that she liked him because they shared a birthday and a favorite football team. Honestly, that might be enough for some people. Here's why it's not. I was looking at some traffic data to see how busy my area of Jacksonville is when I came across the FDOT data for the area. After some playing around on the website, trying to find the busiest roads, I noticed that the bridges of Duval County are anything but serene. Let's do the math and figure out what it all means. Based on 2016 data, here are the average daily traffic numbers for Jacksonville's bridges, starting from the north, including two bridges over the Trout River (first two) and three on the Ortega River. 107500 , 12900 , 73861, 72500, 52000, 12200, 30000, 159500, 5400, 43500, 22500, 137000, 47500. That's 776361 major bridge crossings per day, not including those over the Intracoastal. Actually, let's add those in. 23000, 51000, 42509, and 65500 = 958,370. That means there are more major bridge crossings per day by vehicles than people in Jacksonville, or even Duval County. So what does it all mean? First, there's a lot of water here. Second, bridges must cost us a lot of money. Third, there must be a huge number of people who do not live in Duval County who use the bridges. If you're from out of town or live near me, the 295 is an important road. Here are the traffic cams from the Dames Point Bridge south to the 9B. Reload to see more current images. Enjoy. I've seen a lot of people who tell news reporters to leave them alone, and many others who won't show their faces in interviews. Sometimes, I think it's silly, especially if you were just being interviewed about some random crime in the Walmart parking lot. Then again, there might be a time when you should have remained anonymous, like when you invite the news crew into your home to check out the mold in your bathroom. $139,000 for Doors--What Could I Do For That? So the Interior Department of our federal government is spending $139k for new doors for an office suite. That's a lot of money for new doors, so it's in the news. Granted, we're talking about an office with three sets of double doors, so that would be six doors. And locks were going to be added. And probably some money was going to sealing the areas that leak on the old doors. But it does get me to wondering what I could do for that money at my own office (I work from home). Out of Town Zoo Membership? We had a 100% zoo membership card when we moved to Jacksonville from another zoo. What that means is that some zoos would reciprocate 100% of the admission fees with that card, while others would do 50%. Jacksonville is a 50% zoo, meaning if you have a membership there, you get in ONLY at the JAX zoo for free, and ALL other zoos are 50%. The title of this article is the exact same one used by local news. I don't want to make light of the killing of a human being. However, I believe the title implies two cars were doing the shooting. And it got me to thinking. If the best way to protect ourselves in this country is to own a gun, and if only 1% of Jacksonvillians use mass transit, and if many of us keep guns in the glove compartment, and if AI cars are coming our way, why not? A Woman Who Adopted Eight Kids? The news was feeding me a good-news story about JSO giving out random gift cards to people, and the anchor mentioned that one of the recipients was a woman who had adopted eight children. I had so many questions, but that was the end of the story. I looked to see if I could find a story about 8 kids being adopted in the area, but all I could find is one about a local family that adopted six kids and already had two, for a total of eight. A guy with a local business was arrested for having both grenades and moonshine inside his establishment. I am not sure about the legality of owning either of these items. It's America, so I figure you can probably own both. Wait, you can't own a grenade, but you can own a grenade launcher. You can own a still, but you can't drink alcohol made in it. You can actually get a license to brew alcohol for your car, and I suppose some of this alcohol might spill into your mouth while filling the vehicle. I bet there's some local kid from Jacksonville right now who's good with design skills and wants to build websites for a living. It's a possibility to make a career as a freelance web designer, but I'd recommend getting an education and going to work BEFORE jumping in. Steel vs Sorghum - No Worries For Florida? Let's assume we put huge tariffs on steel from China. It might mean pricier cars, soda cans, and other items that use cheap Chinese steel. Probably the device you're reading this on right now. It will be a true test of Americanism: are we willing to pay more money for the items we use every day? In theory, we might say we are fine with it. When China retaliates with tariffs on sorghum, that also won't seem like a big deal to us in Florida. The problem is that a trade war will affect more than those employed in steel and sorghum. Hooray for me. It's Jury Duty Season in Jacksonville, and I have received my summons. It's right on the heels of seeing a news report about a guy with autism, the mind of a child, and the propensity for flying off the handle when not at home also getting jury duty. If his mom couldn't get him out of it, I guess I'm pretty well stuck doing my civic duty. While it's a hardship for me and I'm probably a horrible juror, my recent articles on The Second Amendment kind of make me a hypocrite if I try to get out of my civic duty as partially described in the Sixth Amendment.